Walking back a recent comment here at FotM by a guy named Jack Stephens (of whom more in a later post), I found some nifty material on the subject of white privilege. It struck me that it's been a long time since I gave the topic the attention it deserves--or plugged Chip Smith's superb book, The Cost of Privilege. So that's the plug. 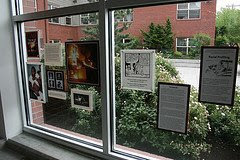 to create an exhibit that would visually and interactively educate people at SPU about the idea of White Privilege. In order for true racial reconciliation to take place on this campus, our majority-white population MUST consider the implications of our whiteness. The duo and a conscript work crew spent the better part of a Sunday night putting the whole thing up for a one day show which rang the changes on the theme of "Liberty & Justice for All." (It had such an impact on those who saw it that they held it over for Tuesday.) I highly recommend going to the well-captioned slide show JJ has posted at Flickr to document their exhibit, and giving it a look-see. Note that JJ and Susie incorporated responses and reactions from non-white friends and acquaintances at SPU to drive the point home. Thanks and respect to the both of them. What a creative and fascinating way to grab attention. 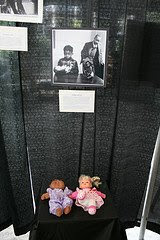 I love the visual examples of white-supremacy like the children's dolls. Linda Leigh Hargrove's blog post raised a couple of interesting points for me. First, like the white SPU students hailed in this post, she is tackling the question of white privilege from the standpoint of racial reconciliation within the Christian tradition. And judging from the other sites she is linked to, there's more of this going on than I knew about. I had felt related concerns from a different direction after Obama's much-heralded speech when the Reverend Wright kerfluffle first blew up this spring. His remarks, it seemed to me, could become a touchstone for white folk unwilling to come to grips with the cost of privilege--for its victims and our society as a whole. Sort of the 21st century version of "content of our character." Casey J Porter Breaks the Lob-Bomb Story! Midnight Music 1--Funny. Real Funny.